A great dwarf form of Evening Primrose, but also called Sundrops as the flowers come out in the morning, unlike Evening Primroses, which come out at night. This plant forms a neat bush mound of glossy green leaves about 30cm high, with deep pink flowers from May to August. Good for the front of a border, rockeries and pots. 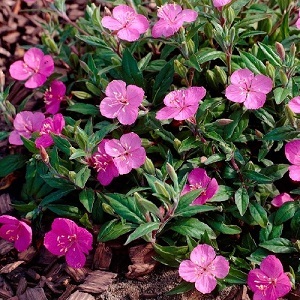 Oenothera ‘Glowing Magenta’ grows best in full sun and well drained soil. It is drought tolerant once established. Pack of approx 100 small seeds. Sow from early spring to summer. Sow before February for first year flowering. Sowing instructions and a colour photo are printed on the packet. 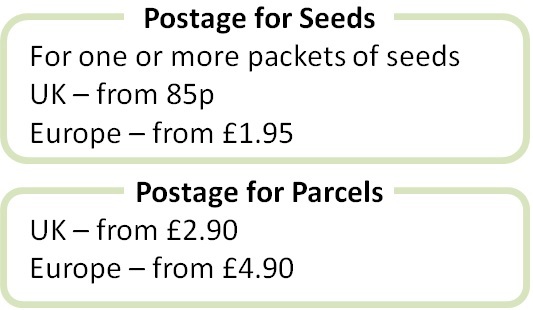 Sow in January for 1st year flowers or sown into summer for next year flowers. Sow the seeds on the surface of a tray of seed compost and press the seeds into the compost. Keep at 15-20°C and germination takes 2-3 weeks. Transplant young seedlings into small pots and then outside into the ground or into containers, after hardening off. Plants die down in the autumn after flowering and grow again in spring. Plants need little attention once established, just clearing up in winter after the plant has died down. Stem cuttings can be done in early summer but plants often self-seed naturally.